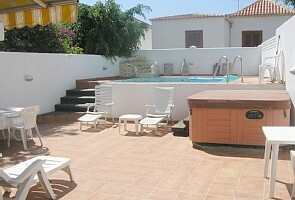 Villa Teanne is a lovely five bedroom villa in the centre of Playa de las Americas in Tenerife. It is situated on the Paraiso Royal complex, which is only 200 metres from the beach. Although the complex has a shared pool which is heated in Winter, the villa also has its own small pool and jacuzzi, as well as a sun terrace which is furnished with sun loungers, a barbeque and patio table and chairs for alfresco dining. The villa is laid out on 3 levels and has air conditioning in most rooms. On the first floor there are three double bedrooms, all of which have ensuite bathrooms. On the ground floor there is a fully equipped kitchen including a dishwasher, a lounge/dining room with satellite TV including English channels and a double bedroom and bathroom. There is also a utility room on this floor with a washing machine. Finally in the basement there is one twin bedroom, shower room, a 2nd lounge and a games room with a darts board and pool table.